The V-Cap OIMP series (Oil Impregnated Metallized Polypropylene) film capacitors are the result of an extensive research and development project by a team of world-renowned experts in electrical engineering, chemistry, materials science, and some of the top minds (and "ears") in the audio industry. These are the same experts who designed the award-winning TFTF (Fluoropolymer Film Tin Foil) series of V-Caps. The resulting series of proprietary materials and processes has produced what we believe is one of the most transparent and musical oil capacitors ever made. Oil impregnated capacitors have long been coveted by audiophiles for use in power supplies, speaker crossovers, and various signal applications. 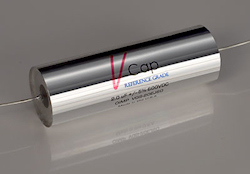 The V-Cap engineering team has developed the V-Cap OIMP series to combine the smooth musicality of paper in oil designs with the transparency and superior electrical properties of modern film capacitors. Uncompromising sonic performance and long-term reliability has been achieved by utilizing a special proprietary metallized polypropylene film, chosen for it's exceptional sonic and physical qualities. Our metallized film is chemically ultra-stable which means you can expect more consistent performance over the prolonged life of your capacitors. Selecting the best film was just one of many stages in the design and refinement process that led to the V-Cap OIMP series. Transferring the unique Variable Stage Quadrant Dielectric™ winding technology to the OIMP series was a stunning development on it's own, but even further progress was made by perfecting the actual oil impregnation process. This ensures the highest level of performance, reliability, and consistency from capacitor to capacitor. Despite the higher expense, the V-Cap design team selected a premium grade solid brass cannister*, deemed to be sonically transparent and structurally superior to other materials tested. The container is hermetically sealed and employs custom made audio-grade diaphrams and end caps, virtually eliminating the possibility of mechanical and electrical failures. This means superior robustness, no leaks, low DF/ESR, and sonics that redefine the performance limit of oil capacitors. The design, materials and processes used to make the V-Cap OIMP series have been so precisely engineered, selected and executed that we boldly offer an unprecedented * LIFETIME WARRANTY to the original purchaser. See below for details. The V-Cap OIMP series is NOT a “rebrand” or relabeling of an existing product, but a unique new capacitor design that has been meticulously engineered and handcrafted in the U.S.A.
* The 47 uF 150V OIMP V-Cap does NOT utilize a brass canister. "V-Cap", "CuTF", "TFTF", "OIMP", "Reference Grade", "Elite Reference" and "Variable Stage Quadrant Dielectric" are trademarks of VH Audio, Inc.